Wondering about the hype around Customer Data Platforms? Read this blog post and learn why this technology is generating so much buzz. …and how many of them didn’t make the cut this year for Scott Brinker’s Chief Martech Marketing Technology Landscape. Lots of marketers find all this overwhelming, or even discouraging. After all, it’s really hard to make decisions when you’re drowning in information. Fortunately, one technology is addressing the growing need for a centralized repository to gather and stitch together all the valuable information you have about your customers. This is the Customer Data Platform – the technology many call the “brain” of the smart marketing stack. In this article we present the most important aspects of this technology. Read on to learn what benefits a Customer Data Platform (CDP) could bring to your organization. What’s a Customer Data Platform? A CDP is “a marketer-managed system that creates a persistent, unified customer database that is accessible to other systems”. 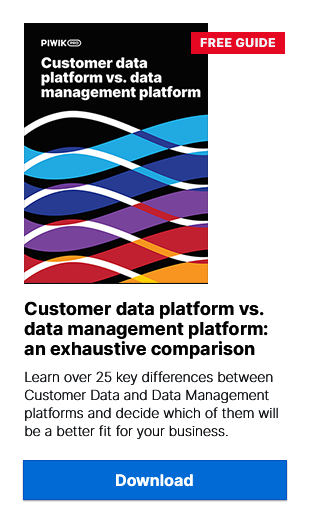 “A customer data platform (CDP) is an integrated customer database managed by marketers that unifies a company’s customer data from marketing, sales and service channels to enable customer modeling and drive customer experience”. What are its key differentiators? A traditional consumer marketing database is typically a data warehouse, built and run by tech-savvy staff. But from a marketing standpoint, the relevance of these tools is often questionable, especially when trying to quickly extract ‘actionable’ customer data from a data warehouse. So marketers often have to rely heavily on the IT department, which slows them down and fuels frustration. With a CDP, it’s much simpler. A CDP provides a prebuilt marketing database or tools that greatly simplify database creation. In both cases, marketers get greater control over marketing database, but some technical skills may still be required. Web, mobile and behavioral data: products added to basket, products abandoned, categories and products browsed, number of pages visited, and more. It’s the kind of data your analytics tools collect. CRM & offline data sources: from web forms, offline surveys and phone calls. For example: postal address information, telephone information, email address information, permission and suppression data. Transactional systems: number of products purchased (both online and offline), order/subscription value, order/renewal dates, product abandonments (abandoned baskets), product returns, and more. GDPR consents data: the list of consents for data processing provided by your users. This is particularly important, because GDPR demands that each usage of data requires separate consent – one for data personalization, and another for sharing the data with a third party. Also, it’s important to stress that the amount of data pushed into a CDP is usually limited only by the number of tools you’re using. Of course, this will vary depending on which CDP you implement. However, for those based on API integrations, it’s really easy to import large volumes of real-time data from many different sources. Sounds better than just the capabilities of a standard CRM alone, doesn’t it? The chances are high that you already know what a single customer view is. It might even be the reason you’re considering a CDP in the first place. After all, it’s considered the best tool for creating unified views of your customers. But if you’re not familiar with this term, let us guide you through the basics. A single customer view (sometimes called a ‘360’ or ‘unified’ customer view) is a way of gathering all the data about your customers and merging it into a single record. By consolidating every piece of information about your users in one place, you get a powerful overview of every action your customers take – on mobiles, on your website, or even in your brick-and-mortar store (you’re only limited by your creativity in which types of data you choose to gather for creating the SCV). All that is possible because a CDP operates primarily on first-party data, which has the personal data of your real clients. To learn more about the benefits of single customer view, we recommend this blog post: What is Single Customer View and How Does it Work? However, this isn’t the case with DMPs. This technology is often confused with CDPs. In a DMP, user profiles are temporary and typically expire after 90 days (depending on the lifespan of a given cookie). The technology focuses more on segments and categories than user-level data or single user-views. All this makes it less than ideal for creating single customer views. That’s exactly why Customer Data Platforms are such stellar tools. With CDPs, the most common way to match users (or customers) together is by using email addresses. Because a person’s email address is unique to them, individuals can be identified and matched across a wide range of data sets. This method is called deterministic matching, and is highly accurate (around 80-90%), especially in comparison to probabilistic matching. The high accuracy of deterministic profile matching means that CDPs can create an evolving database of user profiles, and these profiles are progressively enriched as people continue to engage with your brand. Since information contained in single customer views is highly detailed, the data merged in CDPs is also used for building and expanding audiences. What’s more, after GDPR comes into force in May 2018, CDPs will also be useful for storing GDPR consents. You need to be familiar with GDPR and its impact on digital marketing. Check out the articles in the GDPR section of our blog. We’ll help you get prepared for the new EU law. Example: In an in-store campaign, offering codes that are uniquely generated and tied to a customer profile (for example, special discounts for the most engaged clients, product recommendations). Example: Suggesting specific content to your customers based on their individual interests (such as topics that interest them based on their engagement behavior with your brand’s content). Example: Linking your CDP directly to Facebook or Google so you can use granular segments created in the tool to match the right messages to those audiences. Example: Sending specific messages to people who have unsubscribed from your email newsletter, or identifying at-risk customers and targeting them with purchase incentives. Example: Enriching databases of your data activation tools with information gathered by your CDP. As you can clearly see, the CDP is a versatile and useful marketing technology. However, you must understand that the great power you get from acquiring detailed customer information puts serious responsibilities on you. Simply put, your customers’ data needs to be secure, and you have to store and use that data responsibly and safely. This is especially true because the lion’s share of what your system is collecting and storing meets the definition of first-party data. The practical result is serious data privacy obligations – read more about them here. Even more importantly, under the GDPR and ePrivacy Regulation a significant part of the data gathered by CDPs is considered “personal data”. As such, it should be managed in compliance with the new EU rules. It is your responsibility to check if your CDP vendor can meet the obligations of data controllers imposed by this legislation. Otherwise, you will be at risk for paying some huge fines. That doesn’t sound too good, does it? – How Will GDPR Affect Your Web Analytics Tracking? We trust this article has given you a good overview of the capabilities of a CDP. However, we’re aware that you might have some more questions about this technology. So we advise you to follow our blog and stay tuned for fresh content on Customer Data Platforms, data privacy, data activation, and much more about digital marketing. And if you want to see a good example of a CDP at work, all you need to do is schedule a demo with the Piwik PRO experts.